.... see what they want to see. That's religious people for you. @AC, as you amply demonstrate, two can't. and go out of their way to be offended. And some go out of their way to celebrate. I had to click on the link, The people who see anything suggestive and/or offensive in that shadow seriously need to get real and get a life. I was under the impression that it was their god who came up with breasts in the first place as a convenient system for feeding babies, where is the problem. If you consider that it is being installed at a school, I think you'll find that a couple of swift strokes with a pupil's marker pen would make a profound difference to the statue. Middle man: Yes, yes, next? Eh, not the first time it's happened with a statue. Seems fitting, it is a Catholic school after all. The small boy gently cupping the loaf of bread really does tie it in nicely, doesn't it? Founder of the well-known Catholic parental admonishment against pleasuring oneself was also known as St. Martin the Blind. Now that's what you call daily bread. "When you should have got Michelangelo to sculpt your school statue"
... well, as Michelangelo didn't seem to believe in his sculptures wearing clothes and I expect a Michelangelo "David" with small child might cause even more consternation! 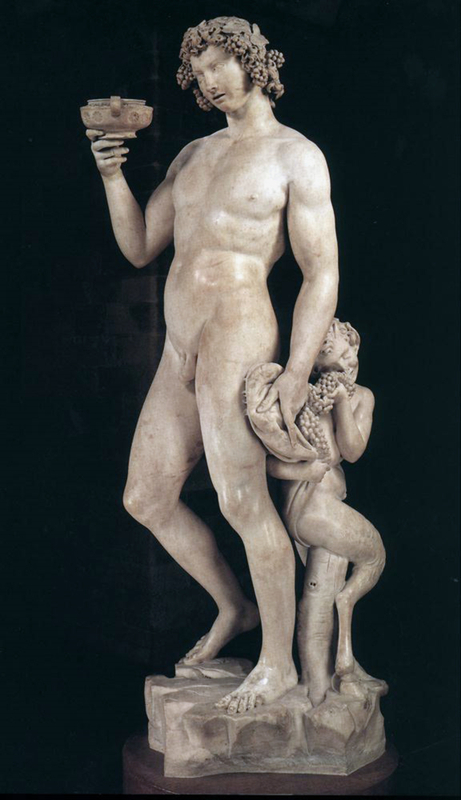 "[...] Michelangelo "David" with small child might cause even more consternation!" Monument of Junípero Serra (with Juaneño Indian boy) on the Plaza de San Francisco de Asis in Havana, Cuba. There are others on the same theme in the US south here and here. His elevation to a saint caused some public protests. This stained glass window in St. Francis by the Sea Laguna Beach, California takes the prize. 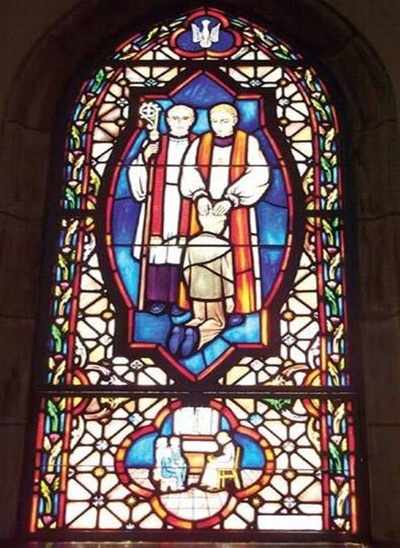 Pictures of this window did the rounds about 10 years ago when the Catholic Church scandals were being revealed. Our Maths teacher drew the usual X and Y axes on the board. Then a line proceeding (for the non-mathematicians) in a drooping North Easterly direction from the origin. A second line in an equally drooping South Easterly direction from the origin, you might say swivelled 90 degrees round clockwise from the first. Bored 13-year olds start sniggering. "I don't know what made me draw that" he said (probably for the thousandth time). I laughed when I looked at the picture. It does look with a quick glance that the saint is holding his ahem. Swambo also thought it was funny when she saw it. Were any sketches made before the statue was created? Gravity doesn't work that way. At all. Very apparently. it's their expressions while doing it that makes it... well you know, Catholic. It's one of those things where at someone suggests it looks a little rude, then we might all snigger at first sight. However after staring at it for a few more seconds it doesn't look at all rude, it's obvious that what's in his hand is just a round lump of something that is in no way attached to the body and doesn't suggest a phallus at all. You come down to earth and realise it's a religious statue, no one's likely to deliberately make a rude statue in church grounds and you simply need to grow up a little bit and see it for what it really is, just a statue. Although it's given the church a full boost of worldwide PR which never hurts to raise a few more shekels in the old church purse!
" You come down to earth and realise it's a religious statue, no one's likely to deliberately make a rude statue in church grounds and you simply need to grow up a little bit and see it for what it really is, just a statue. " It's for a school. Yes, the people looking at it and seeing it as rude need to grow up -- that's why they're called "children". I'm still waiting for the second coming. ... folks who make that particular "joke" are usually waiting on the first. It's always best to come second. "Can't believe some people are actually looking at that statue and seeing a loaf of bread..."
Yep. It's like the London Olympic logo. Once you see Lisa Simpson, you can't unsee her. The Berlin radio tower under DDR control reflected a cross at its top in the days of the wall--and they couldn't get rid of it after much effort. For over the top church ornament, you can't go past the "Sheela na gig" reliefs in a number of Celtic churches. Just look them up and just think how some celibate mediaeval monk thought that they were appropriate.